Sweden commands honor and awe throughout the world in a variety of ways. It consistently ranks near the top of “Nations with the Highest Standards of Living” and “Happiest Nations” lists, it is the birthplace of the Nobel Prize, and has bestowed the world with such treasures as IKEA, dala horses, and ABBA. Therefore, what better way to honor this fine nation than by attending an Embassy event in Washington, D.C.? That is precisely what we decided to do when we went to the Embassy of Sweden’s Grand Opening of 2014 Theme Program: Going Glocal on February 18, 2014. This program was the kickoff to a series of yearlong events to encourage environmental sustainability, global efforts with climate change, resource scarcity, and other related issues. Sweden holds this focus in particularly high esteem: the country is one of the top nations in the world for sustainability, recycling, clean air standards, and adherence to the “reduce, reuse, recycle” mantra. They have ingrained these green initiatives into their society for generations now, putting them ahead of most of the world’s nations that have just recently jumped on the “green” bandwagon. Its proven history of implementing eco-friendly practices and the high regard in which the country is held worldwide make Sweden’s the ideal Embassy to share ecological seminars and get information out to the public. 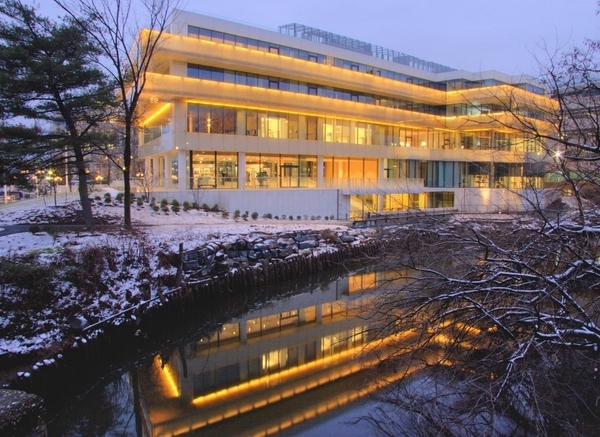 The first thing that one notices about the Swedish Embassy in D.C. is its heavy emphasis on organic materials. The exterior is made from exquisite glass —a “crystal palace” of sorts— and the interior employs heavy use of wood and stone embellishments. Sweden’s love of nature was reflected in the architecture and (coincidentally) further set the mood for the specific “Going Glocal” event. When we entered the lobby, we were treated to reindeer meat hors d’oeurvres and salads that were literally composed of wildflowers and local plants– we uprooted these grasses from a terrarium to “grow” our own meals! The first floor also featured an artwork display featuring beautiful and tragic pieces that highlighted the need for a healthy planet. 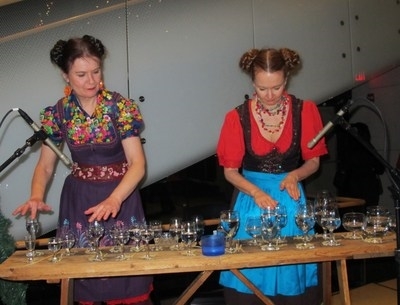 Two musicians provided music for the event; they looked like a cross between Bjork, woodland fairies, and Pippi Longstocking and they played on crystal bottles while singing long, warbling chants. After we dined, admired the pictures, and listened to the music, we descended the staircase. 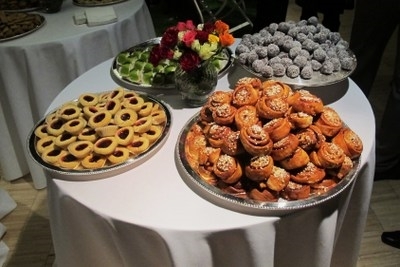 We decided to join in on the fika (a Swedish coffee break) and indulged not only in fine coffee, but an array of desserts including princess cake, chocolate balls, and cardamom buns. We then strolled by art exhibition showing photographs of the von Echstedska Gården, a breathtaking 18th-century Rococo manor house that exemplifies Swedish style: simplicity, an appreciation for nature, and fine craftsmanship. We decided that that was an apt finale to our excursion, and after scouring some free literature (which included art books of the country and Swedish language magazines and journals describing the country’s valuable business partnerships in the U.S.), we said “Hejdo” (Bye-bye) to the embassy and headed back towards American University. As Suecophiles, we were ecstatic to attend such an event. The embassy embodies its country’s national spirit, and the fact that this particular event focused on the very relevant issue of environmental sustainability made it even more intriguing. 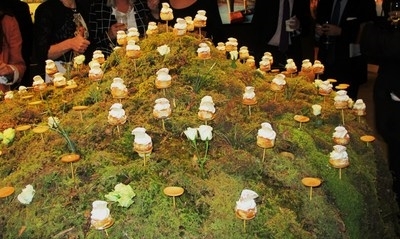 The additional perks of fine art and scrumptious food established this as one of our finest D.C. memories. Therefore, we raise our glasses and say “skål” (cheers) to Sweden and our embassy event experience! Marin Ekstrom is a student at the College of Saint Scholastica and a double-major in Global, Cultural, and Language Studies and Russian Studies. Meredith Morgan studies at Presbyterian College and is majoring in International Studies. They both attended the Washington Semester Program at American University and were classmates for the Spring 2014 Foreign Policy Seminar. Meredith learned about the Going Glocal event at her internship, the Swedish-American Chambers of Commerce (SACC-USA). 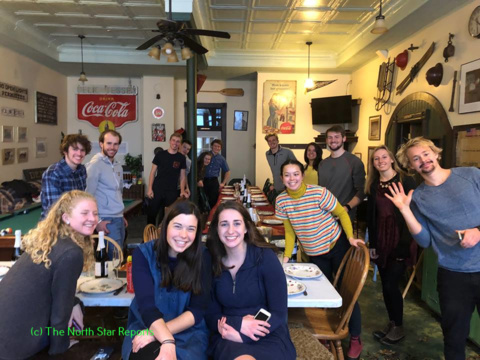 The North Star Reports publishes edited essays from our students, particularly from those who are currently stationed, or will soon be stationed abroad. Students have reported from Mongolia, Southern China, Shanghai, northeastern China, The Netherlands, Tanzania, Ireland, England, Finland, Russia, and Haiti. We also have students developing reviews of books, documentaries, and films, projects on historical memory, the price individuals pay during tragic global conflicts, and analysis of current events from around the world. We will post their dispatches, and report on their interactions with the North Star Reports students and teachers. We thank The Department of History and Politics and the School of Arts and Letters of The College of St. Scholastica for their generous financial support for The North Star Reports and The Middle Ground Journal.